Join us for our Miso seminar and discover exciting new ways to cook with this traditional ingredient! 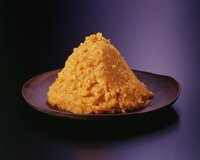 Hiro Fukazawa, a food connoisseur from Miyasaka Brewery USA, will introduce a tasting course meal using Miso for guests to enjoy. Four tasting course will include cheese marinated with Miso, rice cooked with clam miso soup, chocolate miso roll cake and more! Instructor: Hiro Fukazawa, GM(CFO) at Miyasaka Brewery USA Inc. About: A lifelong food enthusiast, Hiro Fukazawa entered Miyasaka Brewery USA Inc. in September 2014. His passion for local cuisines began in college, when he worked at an airline company. He used his benefits to travel to over fifty countries around the world and try local food. After working with airline meal, he decided to pursue his passion in the food industry. He is now the GM(CFO) of Miyasaka Brewery USA Inc., a Japanese company that has been providing Sake and Miso worldwide since 1662. TICrestaurant . Última actualización Ago 01 2018 2:25 p.m.